BCA is piloting a new mobile Buyer App to augment the buying process for both physical and digital customers. The new mobile Buyer App has been developed following extensive feedback from BCA’s customer base. 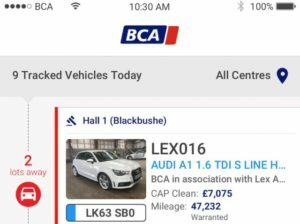 On trial following a period of extensive research and prototyping with over 1,000 customers, the BCA Buyer App has been developed in response to customer feedback and will continue to be improved to meet customer needs. The company is also building on the services offered to buyers to provide a centralised resource to support customers nationwide.